This week I’ve managed to trace one branch of my family tree back ten generations. At least eight of them have a connection with Dysart, in Fife. I now have named ancestors alive when Scotland was still an independent country. Think I’ve answered last week’s question! No family photo today, just a loud “whoopee” for Scotland’s People and all the new records I can search. Great, great grandparents in Dysart Cemetery, Fife, Scotland. My mum gave me this photo recently. 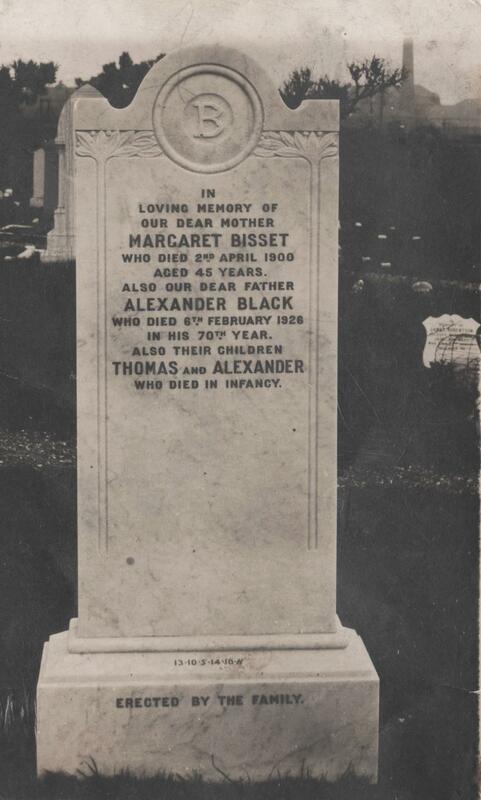 Margaret Bisset and Alexander Black were her great grandparents – and the parents of my formidable great gran. I feel very fortunate to have the photo, with its clear and informative inscription and handy map reference at the bottom. 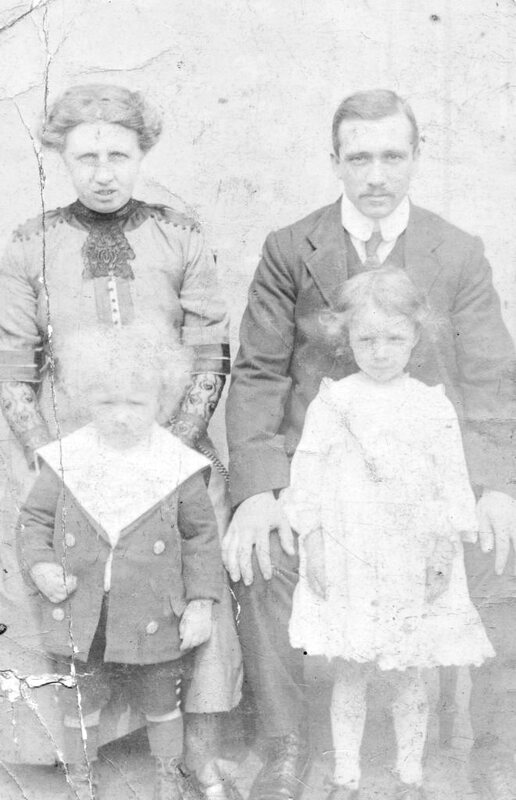 Catherine Black and her husband Alexander Cruden with their two eldest children, Margaret Simpson Bisset Cruden (my grandmother) and Stewart Cruden. Every leaf on the family tree is precious, but I definitely feel a stronger connection to some more than others. In the case of the Black family it is because Catherine Black – this couple’s third daughter – was a very real presence in my early life. I’ve written about my great gran before (On Growing Old Together) as a woman that I admire tremendously. But while I feel I know quite a lot about her husband’s family (the Crudens), my knowledge of the Black and Bisset families is very sparse. I know that the Alexander Black originally came from Kinglassie, and I was fortunate enough to find his parent’s headstone in the Kinglassie Cemetery (Tombstone Tuesday: the Black Family in Kinglassie). Since being given the photo, I’ve done a bit more research into this family. Alexander and Margaret were married on 12 April 1879 in Scoonie, Fife – which is about 15 miles east of Kinglassie. He was a labourer, she a flax mill worker. Both gave their address as Leven (which has kind of absorbed Scoonie). Margaret’s birth record shows that she was born on 19 April 1856 at High Street, Leven. Her father was Thomas Boswell Bisset, a carter and her mother Helen Laing Simpson. Margaret seems to have been the second of 13 children (including two sets of twins). In fact, Helen Simpson may have borne even more children or at least had more pregnancies, as there are gaps of several years between a few of the children. Helen Simpson and Thomas Bisset married in 1851 in Dysart. She was originally from Auchtermuchty – where a branch of my dad’s family (the Traill’s) also lived. I haven’t yet been able to find a record of Thomas’s birth – despite having his parents’ names from his death certificate and a place of birth from a census record. It is possible that one or more of these is incorrect, or that there’s been an error in transcription and I’ll need to try a wider and more imaginative search. Sometime after their marriage, Helen and Thomas moved to Scoonie, where they remained until their deaths. It’s interesting to me that of all the towns and villages in Fife, the same few seem to pop up in so many different branches of my tree. Margaret and Alexander began married life in Scoonie, but had moved to Dysart by the 1891 census where Alexander was working as a coal miner. He continued to live in Dysart after Margaret’s death, appearing in both the 1901 and 1911 censuses. By the latter census, he was living next door to his married daughter Catherine and her family (my great grandparents), and still working as a miner. Margaret Bisset bore at least seven children; Helen, Caroline, James, Catherine and Janet – who all lived to adulthood, and the babies Thomas and Alexander whose passing is noted on the headstone. Margaret Bisset died in 1900 aged only 45, of some sort of hemorrhage (I can’t read the writing on the death extract) and heart failure. Her father Thomas died the following year, while her mother lived until 1914, and Alexander Black died in 1926. As always, when I find out a little about a branch of my family I want to know more. It seems that scratching the surface is also creating an itch that begs to be scratched some more. 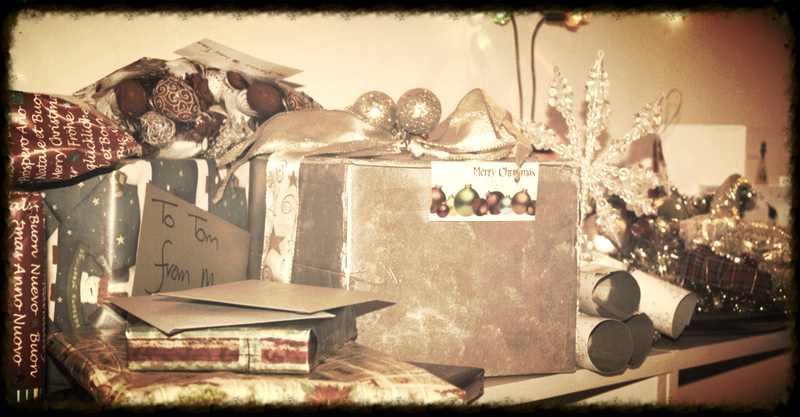 I think it’s going to be a long night. I hadn’t thought about it too much until recently, but I am definitely a family historian rather than a genealogist. While I’m interested in tracing and recording my lineage, I’m much more interested in understanding the lives my ancestors led and the societies that shaped them. This realisation has come about in part because of a conversation I had with my dad a couple of days ago. It’s a major source of disappointment to him that, to date, none of his grandchildren have his surname. Although I’m not married – so still use the “family” name – my partner and I chose to give our son his surname rather than mine. A rare Leslie family photo. My dad is on the left holding my brother. I’m seated on Uncle Tom’s knee. 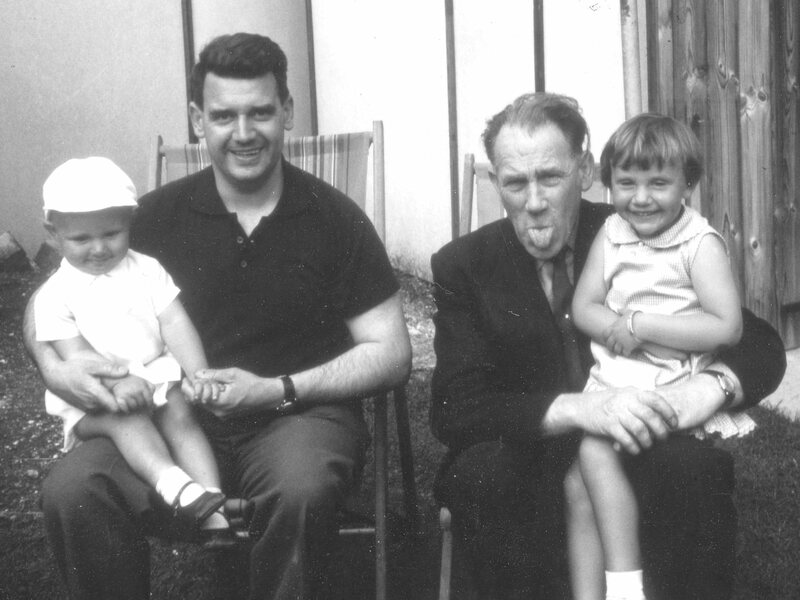 My favourite uncle ever, Tom Leslie was my grandfather David Leslie’s younger brother. I also have two brothers. One of them changed his middle and surnames years ago so his three children don’t meet with Dad’s approval either. My other brother has recently adopted a child and my father was jubilant because he finally has a grandchild with the “right” name. My relationship with my dad is prickly at the best of times, and I have to admit to feeling quite pissed off with him. He probably didn’t mean it, but it really sounded like his biological grandkids were somehow second-best because they won’t carry on “the name.” Our conversation reminded me that when I first talked to him after my son’s birth, he was decidedly sulky over the naming of my baby. I was wondering if that’s maybe why I haven’t made much of an effort to trace the Leslie branch of my family, so I went back to my family tree and noticed that it is 146 years today since the birth of my great grandfather David Leslie. David Leslie was born on July 23td 1867 in Auchtermuchty, Fife, to George Leslie and Janet Trail (who sometimes appears in the records as Jessie, and with her surname sometimes shown as Traill or Jrail). David appears to have been the fifth of seven children born to George and Jessie, although it seems that Jessie also bore a daughter, Christina Trail, the year before her marriage to George. The 1871 census shows the family living in Auchtermuchty, with Jessie as the head of the household. I found this record a while ago, and had assumed that George must have died. Since then however, I’ve found his death certificate – dated 1902. George also appears alongside Jessie in all the subsequent census records up until his death. A search on Scotland’s People shows sixteen people called George Leslie in the 1871 census, and given what I know about George, six of these are possible matches. At the moment, I’m not keen to use up credits trying to find him, so until I can get to the library and use Ancestry, his whereabouts on census night will have to remain a mystery. By the 1881 census, the family had moved to Kirkcaldy. The family consisted of George and Jessie, plus Jessie’s daughter Christina, George jr. William, Elizabeth, Isabella, David, John and Jessie jr. The three younger children were all at school, though it’s likely that my great grandfather would have left at fourteen to go to work. George seems to have spent his working life as a labourer. By the 1891 census, David was working in one of Kirkcaldy’s potteries as a kilnsman. This is the occupation also shown on the extract of his marriage certificate in 1892, when he married Isabella Gourlay. David’s mother Jessie was one of the witnesses to the marriage, along with Isabella’s brother Thomas Gourlay. I know that Isabella’s father Rankine Gourlay would not have been at the wedding, as he was a patient at the Fife and Kinross Lunatic Asylum at the time. David and Isabella had six children; my grandfather David being the fourth. David Leslie sr. died in 1940 when my father was eight years old. My great grandmother Isabella died in February 1961, just months before I was born. As always, the more information I have about ancestors, the more I want to know. But I can’t say that I am any more interested in the Leslie family than any other branch of my tree. I do want to know why George wasn’t at home on census night 1871, and I’d like to know when he made the move from Elgin to Dundee. I’m curious about whether he had siblings and who his parents were, but I’m not driven by any need to prove some sort of lineage. My research will, I think, always be guided by how interesting I think characters are and how much I can learn about their stories. I can’t help thinking my dad would probably disapprove of this too. Stretching back into the 18th century – ancestors who would remember Culloden. Eight generations: seems I’ve had family living in Dysart, Scotland since at least the mid 18th century. My hunt for Nicholson ancestors has made significant progress since I found Mary Todd, wife of Alexander Nicholson and my 3x great grandmother – in the 1851 census. Between the 1841 and 1851 censuses Mary gave birth to five more children, including twin girls. who both died in their first three years. She also buried her mother Margaret, in October 1846 and her husband of twenty years, in November 1848. On a happier note, her eldest living daughter, Ann, married Alexander Campbell, a Railway Overseer, in April 1848. At the 1851 census Mary Todd was living at “Country Road, East Side, Dysart”. Her household included her children Joanna, 18; Jemima, 15; Alexander, 16; William, 14; Andrew, 12; Isabella, 10; Jean, 9; Christian, 6; and Mary’s father James Todd – a retired Carter aged 74 (according to the census). There was also a lodger called Robert Greig, who went on to marry Jemima Nicholson in July 1854. The presence of Mary’s father James Todd in her household at that time gave me my first ancestor I could firmly place in the 18th century, and told me that he was born in Dysart. Mary’s birth and death records also tell me her mother’s name was Margaret Sinclair (death record)/ St. Clair (birth record). I also have James Todd’s death record from Scotland’s People. It shows his parents as James Tod and Margaret Stewart. This is a wee bit at odds with the birth record I found (the only James Tod born at around about the right time), which show his parents as James Tod and Helen Stuart. The different spelling of Stuart/Stewart is to be expected, but the first name difference bothers me a bit. 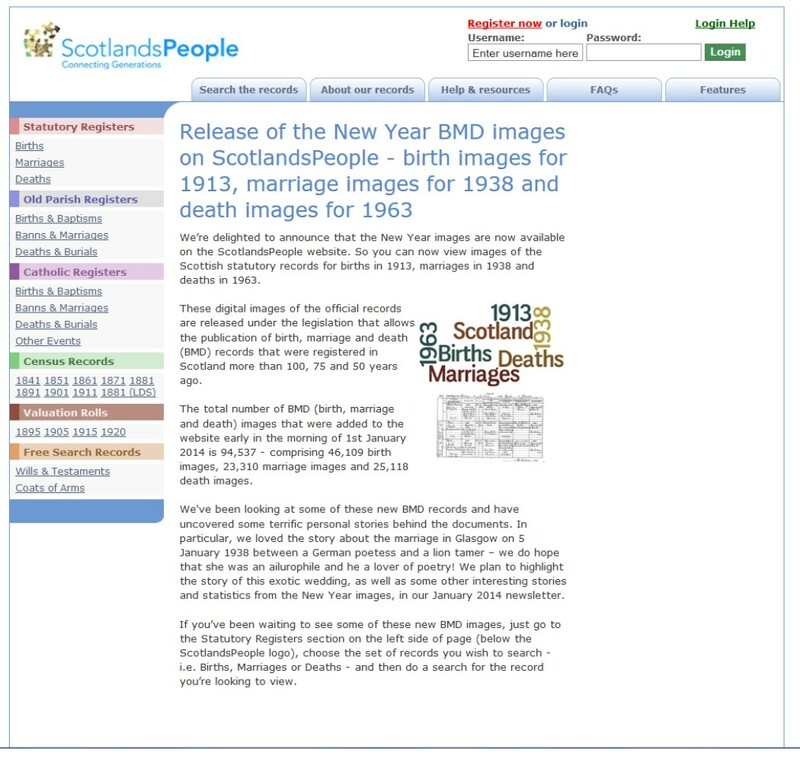 I’m sure the death extract from Scotland’s People is for the correct James Todd – because his occupation and address are consistent with other information I have, and because the informant of the death is given as his grandson Andrew Nicholson (my 2x great grandfather). I’m guessing that Andrew (who was unlikely to have even been born when his grandfather’s parents were alive, may have mistakenly given the wrong name – his grandmother’s rather than his great-grandmother’s? There is a wee bit of evidence for this hypothesis of a mistake in the reporting. James Todd and Margaret St Clair had three children together – Helen in January 1798, Jean in February 1802 and Mary (my 3x great grandmother) in June 1803. If James’ mother’s name had been Margaret, I would have expected to find a daughter with that name. James Tod senior and Helen Stuart were married on 21 November 1767 in Dysart. I don’t yet know how old they were at the time, but assuming they were at least 18, that means they were alive – albeit children – at the time of the Battle of Culloden. It’s also possible that their parents were born before the Act of Union of 1707 and thus were born citizens of Scotland, not the United Kingdom. After a day spent in the public library trying to trace my namesakes back beyond my 2 x great grandmother Susan Forbes, I can report only mixed success. The only Scottish records available through Ancestry and FindMyPast (both of which are available free at the library) are transcripts of census and voter records which are only really useful for the period 1841 – 1901. I had hoped to find Susan Forbes’ grandparents – John Forbes and Susan Foulis, at least in the 1841 census as I figured they would probably have been in their 50’s or 60’s and might still have been alive. But no luck!